...to standard definition (SD) for all major sports events. The EBU has made a considerable long-term investment in its Eurovision satellite and fibre network, ensuring that more than 70 EBU Members holding rights can flawlessly access all 12 HD multilateral signals. As part of the network upgrade, the EBU gave these Members up to eight MPEG 4 decoders each, to give European public service media and the audiences they serve optimal transmission quality. Eurovision Network Director Graham Warren said the London 2012 Olympic and Paralympic Games marked a milestone in the live sports transmission industry. He added, "This is a turning point for Eurovision, and the beginning of the end of standard definition. Until now we have always provided parallel SD and HD signals, but this is the first big event where we have focused all our energy on HD alone." 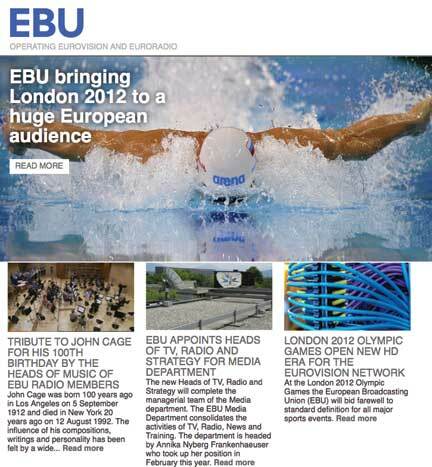 Occupying a square kilometre of the International Broadcasting Centre, in London, the EBU will run 12 simultaneous multilateral transmissions and three unilateral feeds for up to 13 hours a day for the duration of both the Olympic Games and the Paralympic Games.